In watching Syria’s democracy movement from afar, it appears that defections from the top brass of the military and security apparatus have not occurred. A number of lower-level conscripts, however, have been shot for refusing orders to fire on their own people. Meanwhile, the armed forces have killed more than 2,000 citizen civil resisters. Analogies can be difficult, because particular characteristics may not fit any other situation. Yet the Arab Awakening has been in some ways reminiscent of the national nonviolent revolutions that cohered in the Eastern bloc and overthrew communist rule, forging democratic governments starting in the 1980s in Poland, Hungary, East Germany, Czechoslovakia, the Baltic States, Serbia, Georgia, Ukraine, and several republics of the former Soviet Union. By adopting nonviolent strategies, the activist intellectuals who led such movements faced less suppression from the Soviet masters than they would have had they selected other tactics. Earlier reliance on assassinations, gory uprisings, and covert military actions had been wasted, in that they frequently led to increased repression. In a situation not unlike the avowed presidencies of Arab nation-states that ruled through coercion, communist parties in Eastern Europe held the reins of power through government bureaucracy, controlling state and local officialdom, and with a ruling class called by the Russian term absorbed from Latin, nomenklatura, meaning list of names. In some countries, the privileged individuals who were designated for patronage appointments consisted of tens of thousands of persons and their families. Over the years, government dominance and suppression increasingly required maintenance and exertion. With the communists in power ready to employ military force to maintain stability, violent resistance was impossible. Yet as time passed, within the Eastern bloc communist regimes and the nomenklatura, the political will to maintain the party began to weaken. In some instances, reformers arose within the party apparatus and sought liberalization of policies. In country after country, the party began to lose an interest in preserving itself. This phenomenon occurred alongside the growing national movements that in some cases deliberately pursued fraternization—part of their repertoire in facing seemingly adamantine regimes. The nonviolent method of fraternizing with the police and security services is defined by the scholar Gene Sharp in The Politics of Nonviolent Action (1973) as an alternative to social boycotting of the police and army. Instead of ignoring the security services and police, the civil resisters consciously seek to develop relationships with them. The purposes are many: 1) to befriend soldiers and law officers, persuading them that the civil resistance movement has no intention to harm them; 2) to sway the army and police and bring them to see that the goals of the regime that they protect are unfair and unethical, while those of the nonviolent challengers serve justice; 3) to persuade the police and security services to become less proficient in carrying out orders against the resisters and the populace, and even to mutiny and refuse to obey orders; or 4) to persuade the soldiers and police to share information with the people and the nonviolent movement about the plans of the regime. Fraternization goes along with broader popular noncooperation with the ruling system and refusal to enact its edicts. Georgia on the Black Sea was explicitly a part of the Soviet Union, and Mikhail Gorbachev had actively intervened to keep it so. In 1992, former Soviet foreign minister Eduard A. Shevardnadze seized power in Georgia, and ruled by imprisoning opponents, predetermining elections, and stifling speech (although Georgian activists had the benefit of a comparatively free press). Beginning in midsummer 2003, however, and as I discuss in my latest book, a youth organization known as Kmara (Enough) began to channel the opposition to Shevardnadze into activism particularly by the young, and the group’s organizers turned to nearby countries for examples. Kmara’s primary inspiration and advice came from Otpor (Resistance), a nonviolent student group that had galvanized the opposition that brought down Slobodan Milošević, in Serbia in 2000. Adopting lessons from Otpor’s experience, historian Stephen Jones explains that the Georgians succeeded by their efforts to “renounce armed struggle which had proved too costly in Georgia in the early 1990s; mobilize crowds onto the streets to prevent retaliation; ensure international media coverage; fraternize with the police and army; maintain a unified political opposition and establish an alternative source of authority.” The Georgian opposition rallied massive nonviolent demonstrations in the capital, Tbilisi. Recruiting thousands of Georgian youth across the country, Kmara gave a national thrust to the aspiration of the Georgian people to bring to an end the Shevardnadze regime. The central point of contention in Georgia’s case was the 2003 parliamentary elections, which were seen as a test of Shevardnadze’s strength. After the balloting was declared invalid, civil resistance intensified. The youthful leaders grasped the effectiveness of symbolism: even though guns were directly aimed at demonstrators, they exemplified their nonviolent action by placing red roses down the barrels of the police guns at demonstrations, denoting their upheaval as the Rose Revolution. Kmara had for some time been working on fraternization. Not one shot was fired. Realizing that his government was no longer obeying his orders, Shevardnadze resigned on November 23, 2003. There are reports, difficult to verify, of soldiers being killed by their colleagues for refusing to shoot protesters. Low-level military defectors are breaking away in small numbers, but there have been very few high-ranking deserters, largely because the military’s upper echelon is made up of officers from the same Alawite minority sect that President Bashar Assad belongs to. In Bahrain, the top military forces are entirely from the minority Sunni population. In Libya, Qaddafi recruited soldiers from Chad and relied heavily on people from his own tribal group for the same reason. In Burma, ethnic minorities are recruited into the military to repress the majority Burman population, based on a belief that the soldiers will not have the same compunctions about brutalizing people who are not from their own community. Fraternization is not easy and does not work quickly, but it can be an essential accompaniment for a pro-democracy opposition that is standing up to a dynastic father-to-son succession such as Syria’s. This year’s national popular revolts in Egypt, Yemen, Libya, Bahrain, and Syria have sought as a primary objective the breaking down of the presumed father-son inheritance of rule. Public repudiation of bequeathing the father’s power to the son is at the heart of the Arab uprisings. Even if not precisely articulated, the Arab democracy movements have been asking that succession to power and access for appointments not be structured by male lineage and presuppositions of generational accession. Roula Khalaf and Abigail Fielding-Smith note in the Financial Times on August 11 that Syria’s movement “has shown an astonishing ability to sustain itself,” but, so, too, has the regime. They say that “no senior defections in military ranks [have occurred] in five months of unrest.” Even so, a senior UN official in early August briefed the Security Council on reports that Syrian armed forces had opened fire on defectors from their ranks and executed soldiers who refused orders to kill civilians. 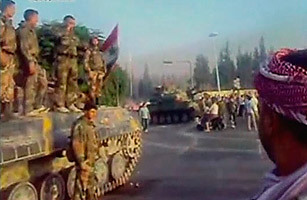 On August 12, a correspondent for the Guardian cited firsthand accounts that Syrian soldiers were shot by security snipers after they refused to follow orders to fire on protesters. Witnesses told al-Jazeera and the BBC that some soldiers had refused to shoot when the army moved into Banias in the preceding days. The Syrian high-level military appear thus far to have followed orders, but an unknown number of foot soldiers have lost their lives for refusing to submit to orders to shoot their fellow citizens. We may not see red roses being placed into Syrian gun-barrels, but other expressions of refusal to obey orders may yet occur. Defections from the police and army can be decisive in national mobilizations of civil resistance. Is it time to reconsider the utility and applicability of the method of fraternization? It’s heartening to read about the success of the nonviolent demonstrations in Georgia. More successes like this can make more people willing to use nonviolent tactics in the political arena.